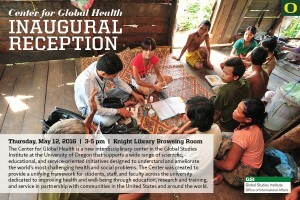 The Center for Global Health is a new interdisciplinary center in the Global Studies Institute at the University of Oregon that supports a wide range of scientific, educational, and service-oriented initiatives designed to understand and ameliorate the world’s most challenging health and social problems. The Center was created to provide a unifying framework for students, staff, and faculty across the university dedicated to improving health and well-being through education, research and training, and service in partnership with communities in the United States and around the world. By the mid-twentieth century, smallpox had vanished from North America and Europe but continued to persist throughout Africa, Asia, and South America. In 1965, the United States joined an international effort to eradicate the disease, and after fifteen years of steady progress, the effort succeeded. 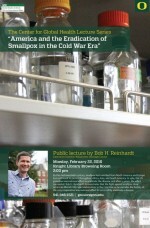 Bob H. Reinhardt demonstrates that the fight against smallpox drew American liberals into new and complex relationships in the global Cold War, as he narrates the history of the only cooperative international effort to successfully eliminate a disease. Please join the Geography Department this Thursday, February 4th in welcoming Dr. Clare Evans from UO’s Department of Sociology as this week’s Tea Speaker. Her talk is titled Multiple Contexts and Adolescent Body Mass Index: Schools, Neighborhoods, and Social Networks. The talk begins at 4:00pm in Condon 106. Please join us for snacks beforehand in Condon 108 starting at 3:30pm.